Last year, Apple Chief Executive Tim Cook suggested the company's "Services" business could grow to the size of a Fortune 100 company within 2017. After the company's second fiscal quarter of 2017, Apple's steadily growing Services business —encompassing Apple Music, the App Store and more —is well on the way to matching Cook's prediction. The Fortune 100 is a list of the largest companies in the United States compiled by Fortune magazine, ranked by gross revenue figures for the entire year. While it is impressive for a company to reach the wider Fortune 500 list, requiring over $5 billion in gross revenue to make the list, the barrier for entry is so much higher for the Fortune 100. For 2016, the five lowest revenue-generating companies on the Fortune 100 list all brought in between $28 billion and $29 billion in gross revenue annually, with Northwestern Mutual in 100th place at $28.11 billion. For reference, Apple is in third place on the list with $233.72 billion, according to the table, behind Exxon Mobil ($246.2 billion) and Walmart ($482.13 billion). In Apple's second quarter of fiscal year 2017, its Services arm generated $7.04 billion in revenue. When combined with the reported quarterly revenue of the previous three results, Apple's Services business accounts for $26.51 billion in gross revenue for the one-year period from Q3 2016 to Q2 2017. Based on this, Apple's Services is currently $1.6 billion below the gross revenue of the 100th-place company on the Fortune 100 list. When expanded to the Fortune 500 rankings, the total revenue for the last four quarters would put services in 108th place, just behind Rite Aid's $26.53 billion in gross revenue. Despite the seemingly large $1.6 billion shortfall, it is still highly plausible for the Services arm to reach Cook's goal within the next two quarters, based on previous performance for the Services business. 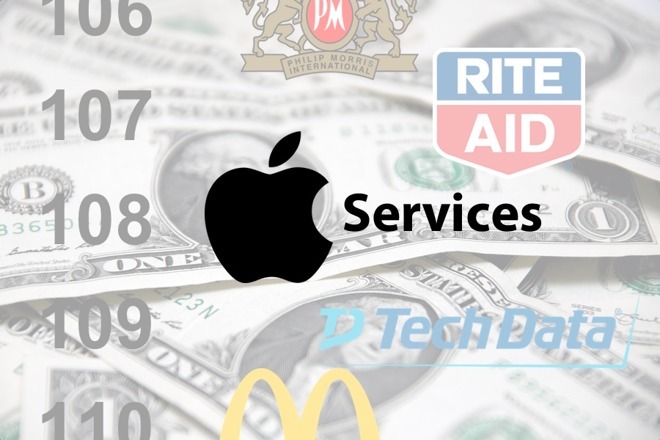 Total revenue for Apple's Services business over the last 4 quarters would put it in 108th place, just behind Rite Aid's $26.53 billion in gross revenue. In analysis of the segment earlier this year by AppleInsider, it was noted that Services revenue has offered positive year-on-year growth of between 9.1 percent and 26.2 percent over the last two years. Compared to other product segments, Services continues to be relatively unaffected by seasonal variances, with minimal sequential quarter dips in revenue. In the latest results, Services saw year-on-year revenue growth of 17.5 percent, slightly reduced compared to the 18.4-, 24.4-, and 18.9-percent year-on-year growth experienced in the previous three quarters, but still quite consistent with the overall growth trend for the last two years. To reach the same level of revenue as the lowest-placed Fortune 100 listing by the end of the year, Services would have to report a combined revenue growth of $1.6 billion in the next two quarters. It is possible for this to be achieved in the next quarter, but it would require Apple to set a new record in Service revenue growth. To do this, Services would have to generate at least $7.58 billion in revenue, which would represent a year-on-year growth of 26.8 percent on $5.98 billion from Q3 2016, higher than the 26.2 year-on-year growth recorded in the first quarter of 2016. Achieving the same result in two quarters is a much easier prospect, partly because of the higher $6.33 billion figure from Q4 2016. If Apple saw just 13 percent Services revenue growth for each of the next two quarters, the total revenue for the four last quarters would be just over $28 billion, equalling Northwestern Mutual's gross revenue. As of Tuesday, the average year-on-year gross revenue increase for Services is 18.5 percent, based on figures from the last eight quarters. Taking this into account, it is likely the Services business will meet Cook's prediction quite comfortably. Based on Services revenue growth at the 18.5-percent average, it is plausible for the arm to have a four-quarter gross revenue in the region of $28.8 billion. In the current Fortune rankings, this would effectively put Apple's services in 98th place, ahead of Tesoro and Time Warner on the list. It is worth noting that this theoretical ranking for Apple's Services is based on the currently-listed figures on the Fortune list. It is a certainty that the revenue of companies on the list will vary over time, so the figure the Services arm has to beat, in order to be considered the equivalent of a Fortunes 100 company, will have changed by the end of the year. Whether that moving target increases or decreases remains to be seen. For example, Time Warner saw its annual gross revenue drop 2.3 percent for the last fiscal year, but still improved on last year's rank of 104 to 99 this year. Northwestern Mutual, in 100th place, achieved its improvement from 109th position with a 2.4-percent increase in revenue. The 98th-placed petroleum refiner Tesoro only just stayed within the Fortune 100, plummeting from 77th with a 29.7-percent year-on-year annual gross revenue decrease. The only real way for Cook to turn out to be wrong about Services is if Apple's growth trend in that segment is severely interrupted. But that appears quite doubtful. Analysts believe the Services sector will continue to grow steadily, with Apple Music seen as a "very attractive opportunity" for user growth, according to Amit Daryanani of RBC Capital Markets. Apple has already confirmed Apple Music's growth, with double-digit revenue increases reported in the last quarter. The upcoming "super cycle," releases of the "iPhone 7s" and "iPhone 8" this fall, more acquisitions, and other product launches are also seen by analysts as factors that are likely to bolster Services revenue growth. With the potential for the Services arm to reach Cook's expectation by the end of the year seemingly likely to happen, Apple's chief executive is still looking for bigger improvements. There are now plans to double the size of the Service business by 2020, a prospect that could certainly happen if Apple is able to continue growing at the current clip.